The most popular is probably still the classic white French tip, is the choice of the nail bed is still covered with a Covergel, to hide the version of the natural nail growth. But more daring customers can choose between all sorts of colors and forms are free to choose, There are a lot of design accessories such as pearls or rhinestones, processed in the gel or tattoos, which are glued to the nail. The actual shape of the nails varied greatly now. From the very natural almond shape, over the square square shape to the pointed stilettos, there are countless forms, may be filed in the nails. 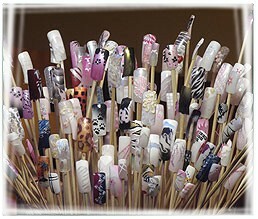 The length of the nails is individual taste. Many customers can simply amplify their natural nails with gel and keep it short, but there are many customers, which particularly like long nails very well, and which often leave the natural nails extended with gel.